When looking for storage boxes or baskets for the RV bathroom cabinet I realised what a tall order it was to find something just the right size. With some pipework in the way I already knew I'd have to cut down a box to make it fit and storage boxes and baskets just aren't cheap! I realised that my shelves were going to fit 2 photo-copy paper boxes side by side rather perfectly! Our local Staples leaves these boxes out by the front door and you can just pop in and grab them - for free! I took a slow browse around Michaels deciding what I was going to use to cover these boxes. My original vision was baskets, and I certainly wanted to stick with the natural fibres - both colour and look. I went with what I could find really and in the end that turned out to be burlap. I bought some rolls of laminated burlap - which had some kind of backing holding it together a bit but it was pretty see-through. I needed to cut down 2 of my boxes in height for the top shelf so I did this first. I also had to cut down the back of one of my boxes to fit around the pipework - this box doesn't really have any functionality - its pretty much just the front and sides of the box acting as a cover-up to the pipework behind. Once all cut to size I gave them a quick once-over with some tan spray paint. Because the burlap was pretty see-through the colours and print on my boxes showed through. With a quick and imperfect coat of paint it blended in. Starting in the middle at the back of a box I used my hot glue gun and spread out a 1 inch strip of hot glue I stuck down one end of the burlap roll. The hot glue dries so quickly I found that I was only able to glue a couple of inches at a time - giving myself enough time to pull the burlap taut, stick down and smooth off, all the while making sure I was keeping it in line with the bottom of the box. It moved along nicely and before I knew it I was back to where I started - I overlapped the burlap at the back of the box by about an inch. My roll of burlap was deeper than my boxes so I'd left my excess at the tops of my boxes. Once all the sides were stuck down I cut the corners and folded in the excess and stuck that down too. 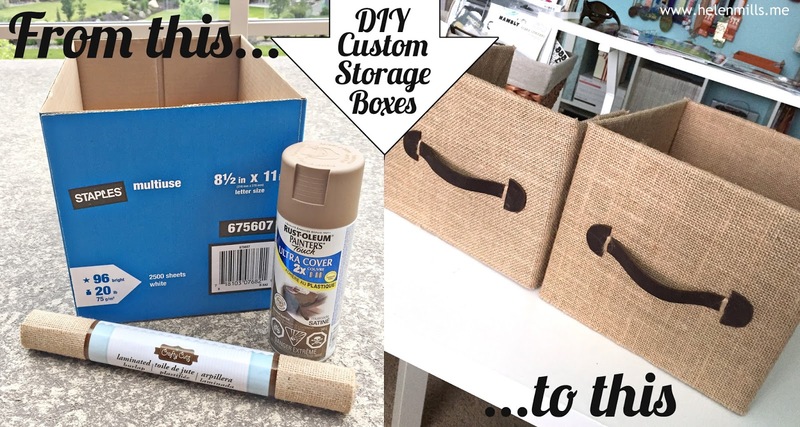 It is preferable to have a bit of extra to fold in to keep your top edges nice and finished looking (especially since burlap has a tendency to fray). My boxes were done! But I felt they needed a little finishing touch of some kind. Another trip to Michaels and I found a sheet of brown leather. It was a pricey addition compared to the cost of the rest of the boxes but worth it! I searched Google images for travel trunk handles and found a shape I liked. I sized and printed out the image and then used this as a template to cut out my four handles. Using the hot glue I stuck down the 2 ends of the handles, making sure to leave 'room' so they stick out (you don't want them lying flat or you'll have nothing to grab a hold of!). Finally I sewed around the ends using some strands of the burlap which I'd frayed off the edge of my leftover sheets. I think rivets or eyelets would also have been a great way to fasten them on! I did add a sheet of felt to the bottom so the boxes slid in and out of the shelves a bit smoother but that's unnecessary! I am totally loving the way they turned out! They are a perfect fit for the shelves and look great! 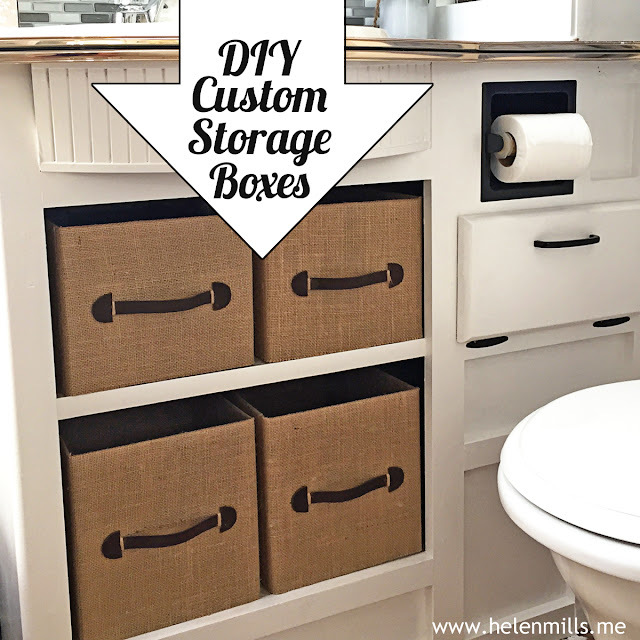 I'm wondering where else needs storage boxes now.....?! It's been a while since I've done a Rock 'n' Rock race (2011 Vegas to be precise). I was looking forward to it. Not least for the fabulous bling that had already been previewed on social media ahead of the race. I'm not usually one to run for bling but the medals sure were purdy!! And when running both races you also qualified for the Remix medal - so 3 for the price of 2!! Unfortunately I was missing my #1 cheerleader this weekend so I headed off on the 4.5 hour drive to Vancouver on my lonesome. Thankfully the weather was good and still no sign of snow on the mountain passes yet. The 2 races both start at opposite sides of the downtown area and then finish in yet another location in Stanley Park - 3 points on a triangle to figure out. But I found an ideally placed Airbnb place which worked perfectly for my accommodation. My plan for the weekend was to race the 10km (And my big goal was a sub-50 minute) and then take the Half kinda easy going with no time goal. I met up with a fellow Team Tough Chik friend Tina for lunch and then spent the afternoon strolling around Vancouver. It was a bad choice for self care. I clocked around 5 miles of walking, ate poorly, didn't rehydrate enough and by the end of the evening was vegging out in my apartment binge watching Homeland on Netflix with a headache from hell. It wasn't a good feeling knowing I had a half marathon to do the next morning! The Half got going at 8:15am this time from the Convention Centre side of town. It was a easy stroll down the hill for me, chatting to Chris briefly on his way to work. I wasn't feeling pepped up at all - I had a dull headache still, hadn't slept well and experiencing a bit of numbness/aching in my foot when walking. It was just as well I didn't have a goal for this race other than to finish! The start line was much busier (and yet the potty line ups were much quicker! ).I stayed bundled up in my throw away hoodie to the side of my corral until the last minute. I was in corral 4 so watched the first 2 waves head off. They counted down for Corral 3 and the crowd surged forward with me in it - There were corral 4 people all around me but yet we didn't seem to stop and before I knew it I was across the start line and on my way! 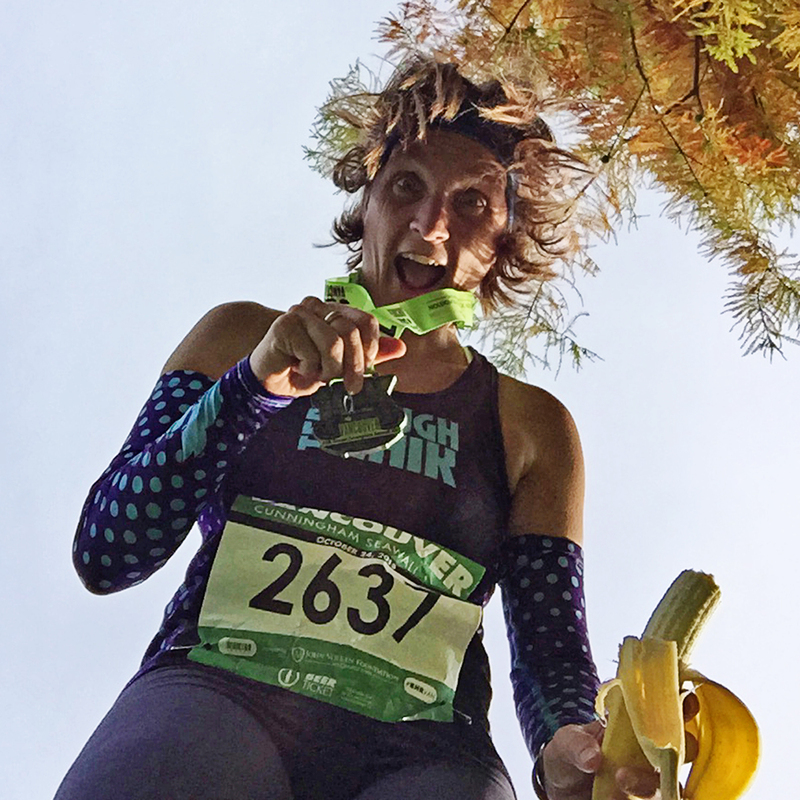 It was the most understated and unexpected start of a race, and given my nonchalance and mental state it was actually probably the best thing for me. As soon as I get going I settle in and get comfortable. Unsurprisingly the headache and foot pain were soon distant memories and I started enjoying myself. 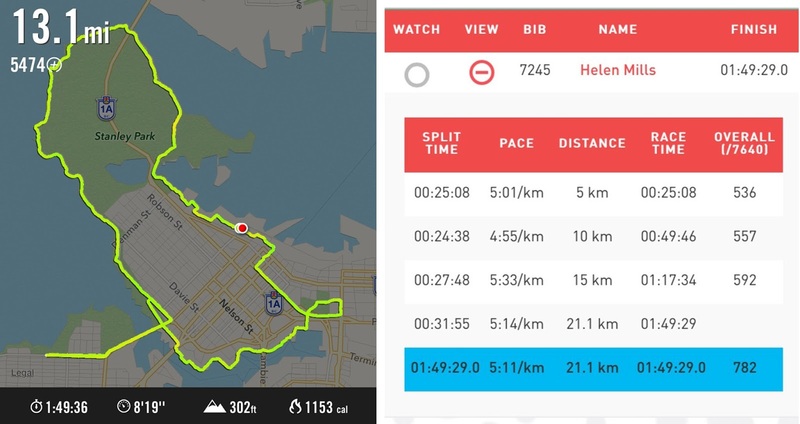 Almost immediately we headed through Gastown, it's a great little area of the city with brick streets, old buildings and lots of character - a very picturesque area to run through and reminded me it was more than just the running! A mile in we passed a large gaggle of hobos outside a shelter and it was the perfect place to ditch my throw-away hoodie (I hope someone is keeping warm in Chris's too-small-for-him Icebreaker merino wool top!). The course headed out along the railway tracks and industrial port area before looping around, passing through Chinatown, BC Place and Rogers Arena and then onto the Edgewater along False Creek to Stanley Park. Instead of running the seawall like the 10k the course took us into the depths of the park along it's many greenways and roadways surrounded by towering green trees and lush forest. The last couple of miles were along the roadside right next to the seawall path we'd run the day before, with the final 1/4 mile putting us onto the path by the sail club and through the same finishers archway. I'd had a solid comfortable race and was happy to finish in 1:55hr. Another fabulous medal, another fabulous beer and my first successful double-run weekend! I stayed a little while at the finishers area. Yukon Blonde were headlining the post race party and the sun had come out. The beer went down sweetly but I was also eager to get going for my long drive home. It's definitely not quite as fun doing these race weekends solo. I walked the mile back to the apartment all the while looking out for the bus that never came (but then it probably was an ideal shake-down for my legs anyway! ), jangling my medals as I went! Oh my, what a race!! 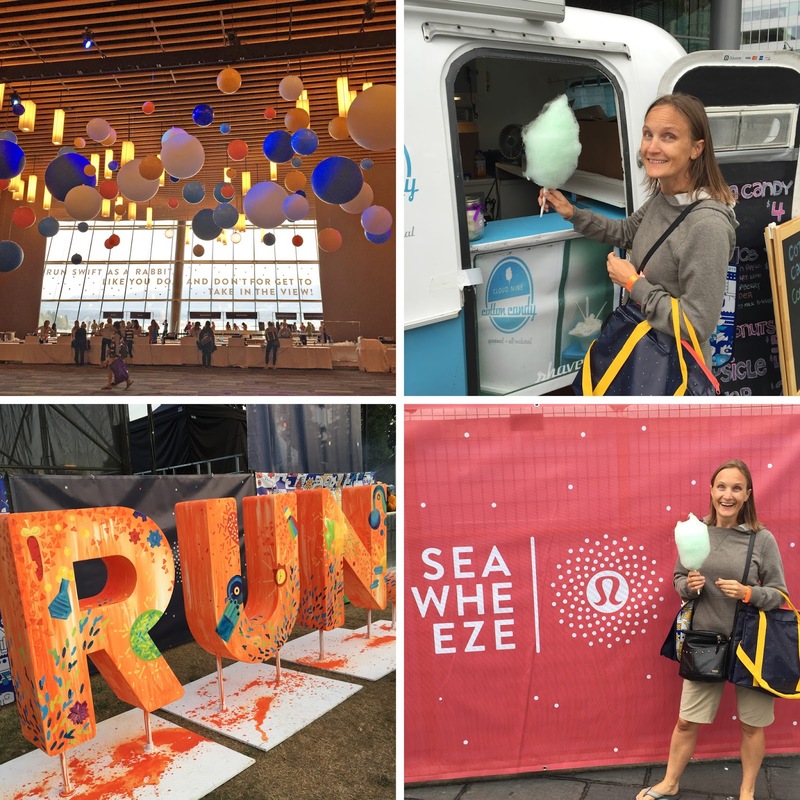 The SeaWheeze was my 10th Half Marathon and I have so many reasons to love it! 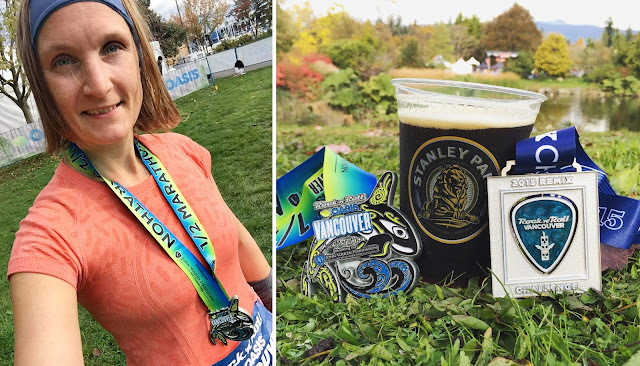 Lululemon sure knows how to put on a good race. The entry fee price tag is quite a bit more than your average half marathon and in previous years I was unsure that it could be 'worth it'. This years race went on sale 11 months ago and I was lucky to get in - it sells out in minutes! So, what DOES your $128 get you? and why I'm utterly convinced it WAS worth every penny! First up you get a pair of special edition Lululemon shorts, designed with an exclusive print. I gotta say, and this is probably my only thumbs down for the 2015 race - I didn't love the print. We all received these in the Spring giving us plenty of time to train with them before the race. Race start was 7am Saturday morning. It was a cold one in Vancouver. Around 15 degrees, distinctly grey and cloudy and wet on the ground (though we more or less escaped actual rain during the race). We were staying in North Vancouver and after a brief flapping session by moi the night before about what time the buses started running we opted to just drive ourselves in. It was the weekend so parkade prices were on special pricing and we parked all day for $7 - more than worth it in my books (and actually cheaper than the bus as it happens!). The parkade was underneath the Marriott Hotel and was probably 300 yards from the start line! It was also ideal that I was able to use the hotel wash-rooms (which were clean and no lines!) right up till the last minute instead of porta-potties. Score! I crammed myself into a corral near the start line. 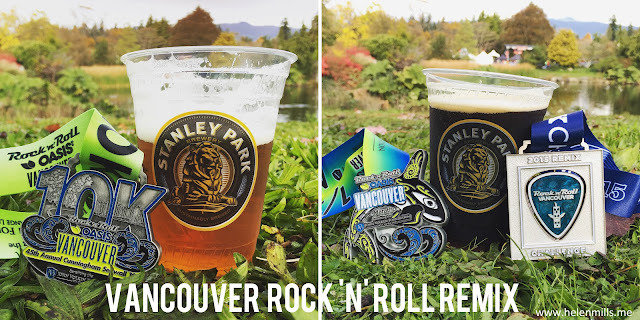 I vaguely recall seeing the 1:45 and 1:50 pace beavers (beavers not bunnies at the SeaWheeze!) but it was the first entrance to the corrals I'd seen when we came out of the hotel I didn't think anything more of it. They set us off in waves with a good 5 minutes between - as it was I was in the second wave! The course was gorgeous! The first 2 miles looping through the city and then just after the 2 mile marker we ran for nearly 2 miles along False Creek - you can't beat water views on your run (and of course marvellously flat! ), we headed across the Burrard Bridge (where Lulu HQ is and one of their 3 huge cheering squad stations were based - more high-fives for me! ), an out and back section in Kitsilano, back across the Burrard Bridge (where there was a bit of drag of an incline getting up and over the bridge - not much to look at when you drive but it's most definitely there when you're running! ), and then we got back to the water again - and from mile 7 onwards we pretty much followed the water for the rest of the way! Gorgeous right?! Past Sunset Beach, English Bay and then into Stanley Park to run all the way around the Seawall. More cheering squads, Mermaids sat out on the rocks, SUPers cheering, DJ's playing music, people dressed up in costumes - and I really did just soak it all in. I enjoyed everything about the atmosphere and there was great crowd support and 'stuff' to look at along the way. I was still doing really well with my pace. And I felt good. At times of course I wanted to slow down or take a break (I've developed a bit of a habit of stopping on runs, that's what comes from having a dog as a training partner - they stop to pee and sniff a lot!) but if I was honest with myself I didn't NEED to so I just kept chugging forward as fast as I could. It hurt. Not in a pain way but in a 'giving it all I've got kind of way. Which really is the point of a race I suppose. The last couple of miles were Tough. I REALLY wanted to stop but I knew this was going to be my day. I tried calling Chris at the final mile (who didn't pick up!) to let him know I'd be finishing earlier than I'd expected to! My pace was awesome. I wasn't super sure if I was going to break the 1:50 mark but it was certainly going to be close. As we came into the final straight stretch to the line the 1:50 pace beaver was next to me shouting at his wards as he propelled them forward to the line. Cheering them on, telling them the line was in sight and to run faster, faster!! I felt like I had nothing left and I desperately wanted to walk. The line eventually came into view for me and I managed to hold out and crossed the line with him! My Garmin said 1:49:36. WooHoo! I found Chris straight away and caught my breath as I chatted to him over the railings. Then I made my way through the finishers chute, picking up my medal (a big heavy golden carrot! 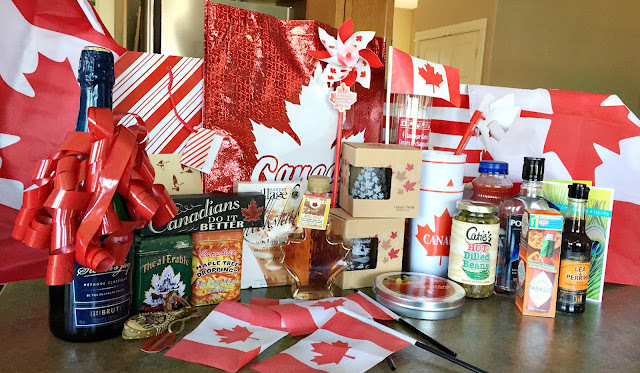 ), a mini pouch of Saje essential oils, a Seawheeze baseball hat, then water, wet flannels and a kind bar for some instant recovery. 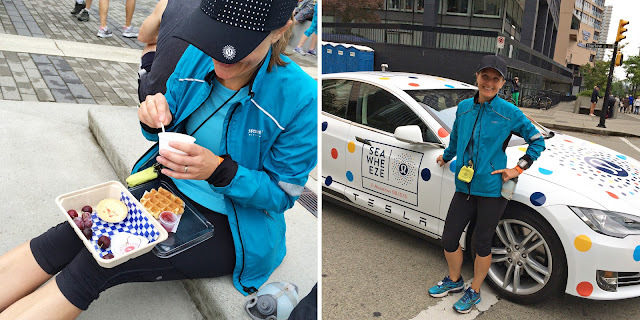 Once away from the mayhem of the finish line I made my way over to collect my finishers brunch consisting of fresh fruit, yogurt, waffle, savoury quiche and juice. An awesome finishers brunch, a great finishers hat and the Tesla pace car! We hung out for a while at the finish. My efforts had really wiped me out! Just goes to show I really did give it everything I had (and that I obviously don't when training coz I don't feel that 'spent' usually). After a nap and shower we were back out in Vancouver for the evening. I got a much deserved Caesar and food in Gastown before we hopped on the bus to take us to Stanley Park for the Sunset Festival. (part of my entry fee and just $25 a ticket for Chris). We were too late for the Yoga portion of the event but we settled down on the grass for the music. 3 bands over the course of the evening, a craft bazaar area, and open bar - which I loved. So often you can only have alcohol in small fenced off ugly confined areas but after checking ID you were given a wrist band and could buy from the multiple bars and sit anyway in the festival grounds and drink! 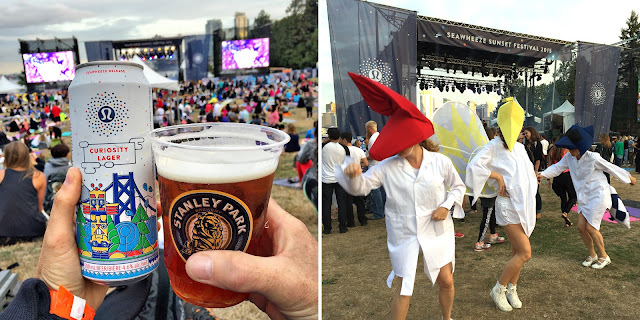 I'm not usually a lager drinker but I was in the mood to have the special edition SeaWheeze Curiosity Lager brewed by Stanley Park Brewery, we grabbed some food and whiled away the evening as the sun set across the water lighting up the skyline of Vancouver. Pure magic bliss and the perfect end to my perfect day. (and Hell Yeah to me and my rockin' new PR - yeah baby - chip time was 1:49:29!!) I finished in the top 6% of women and top 10% overall which feels awesome! **Lets just talk goals for a moment....early this season I'd set this race as my GOAL race for the year - My PR was 1:51:26 and I wanted to break the 1:50 mark - 1:49:59 would be just fine with me! That meant I needed to run a mile in 8 mins and 23 seconds - and do that 13 times in a row!! - However my training times had not suggested I was anywhere near that pace and I'd started thinking my goal time was a little lofty (after all my PR was 2 years ago, and since then I hadn't even gone under 2 hours! 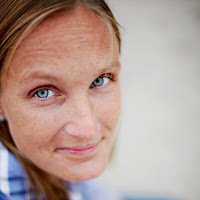 This summer I did follow a 'get faster' training plan (The 'Train like a Mother Own It' plan) so there was lots of speed work which I've never disciplined myself to do. But often the plan would call for holding race pace for a longer distance or time than I could manage. So as the weeks progressed I had considered that just getting back under the 2 hour mark should be a little more realistic and that aiming for paces more in the region of 8:45 (which would get me a finish of 1:55) instead of 8:23. 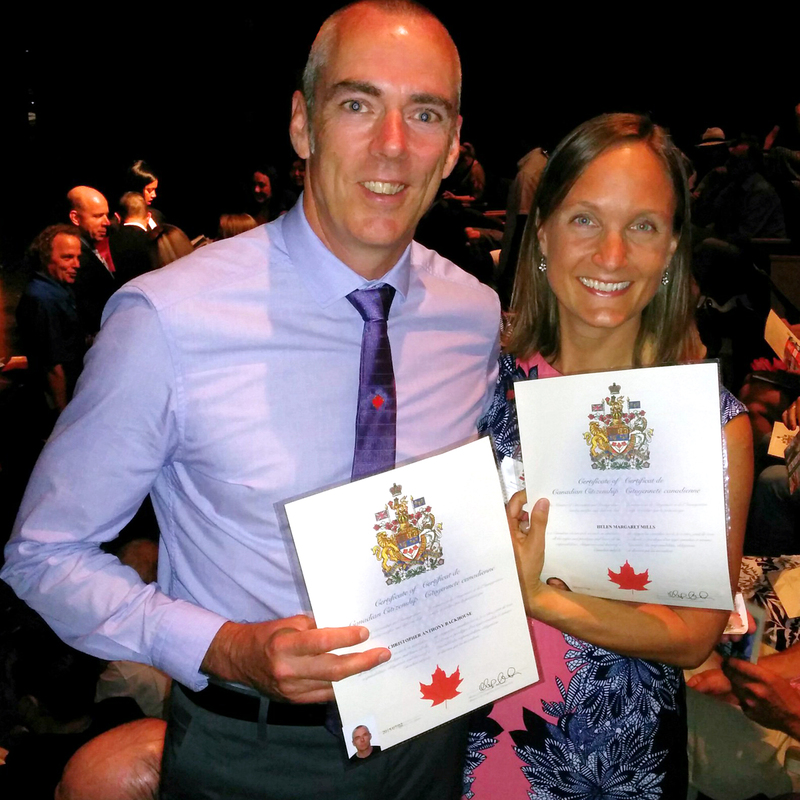 On July 2nd we swore allegiance to our Queen and Country and were sworn in as Canadians! 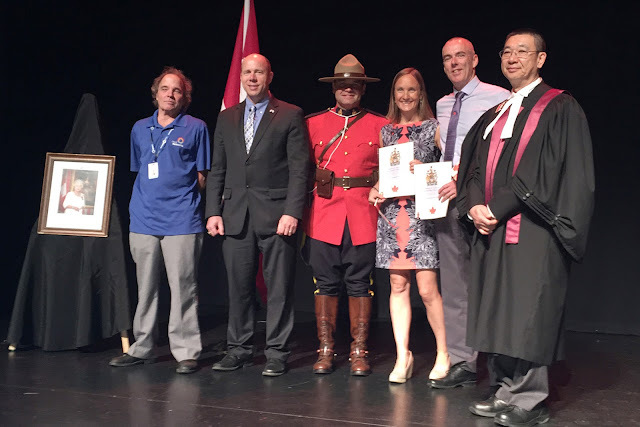 The Rotary Centre for the Arts in Kelowna was full of a gaggle of people from many different nationalities all eager, excited and a little emotional about this day! After a little preamble by the master of ceremony, our local MP - Ron Cannon and a rep from the City of Kelowna we got down to business. All en masse reading the oath, singing Oh Canada (Chris and I had been practising the words for days!!) and then lining up to receive our certificates it was done! Following the ceremony we headed across the road to the newly opened Cactus Club at the Kelowna Yacht Club - overlooking the lake, with views and atmosphere that reminded us just why we picked the stunning Okanagan to call home! 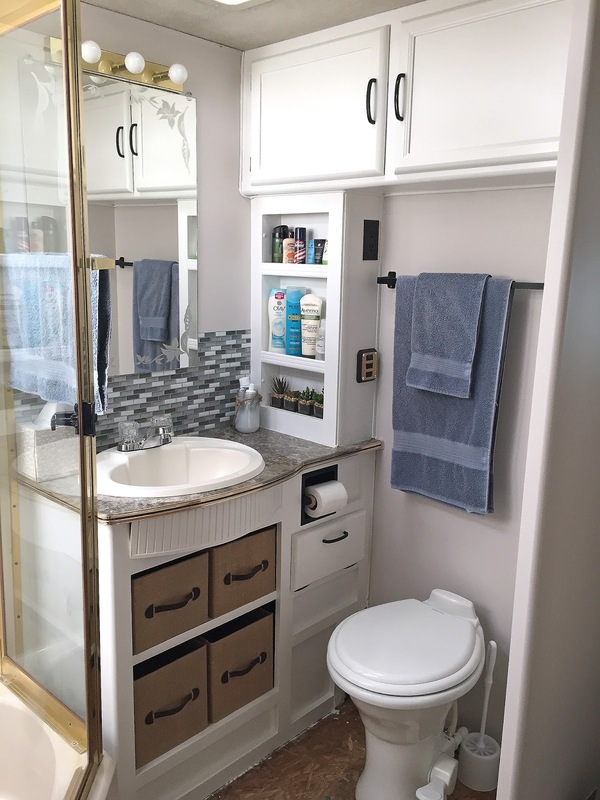 The bathroom was probably the biggest disaster we were dealing with and since the toilet was out and then replaced it was here we started with the renos. We decided to paint all our cabinets and this was where we started! 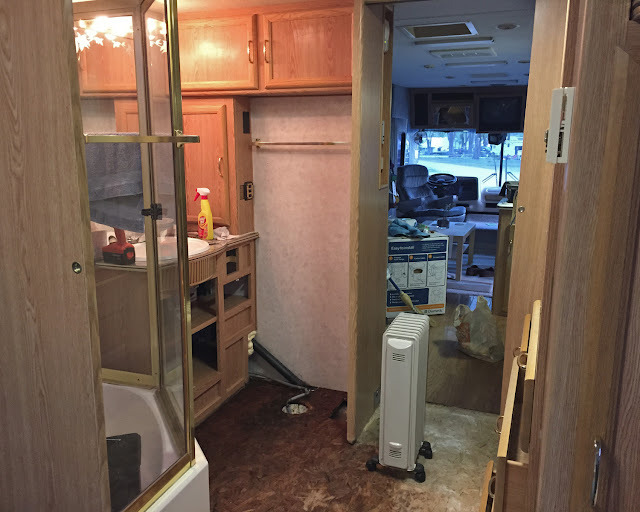 All the cabinet and closet doors came off. Surfaces were thoroughly cleaned with a strong solution of TSP and then very lightly sanded, and then cleaned off again. The doors were part real wood (the framework around the outsides), and part dodgy wood-effect laminate type stuff (the centre of the doors). The cabinet bases were all the laminate. I say laminate - I think it's some sort of particle board that's been covered with a wood effect kind of paper. All I do know that when it's in contact with water over extended periods of time the board expands and the paper cover 'bursts' so we have a few lumps and bumps around from the water leakage issues we've had. We bought Behr One-Coat latex paint in semi-gloss for the cabinets (Whisper White). The nice man at Home Depot convinced me I wouldn't need a primer with this paint. I was skeptical. And I had good reason. The cabinet base took 3-4 coats of paint (that was the fake wood stuff). It was tedious work I'm not gonna lie. All those nooks and crannies where you needed to use a paint brush. The top coat was done with a small foam roller which evened out the brush strokes and left a nice smooth finish to all the flat fronted areas. Same with the doors - we used a brush to get into the corners and edges of the doors and then the fronts were finished off with top coats using the roller. (The real wood edges generally needed less paint - just 3 coats). 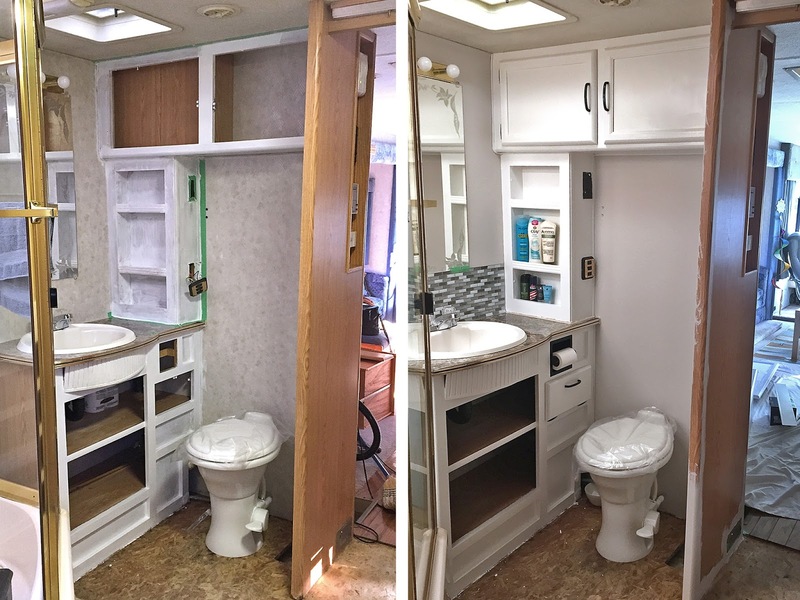 Cabinet doors everywhere! We probably could've saved ourselves a bunch of time doing them in a more assembly line style but space was limited! Making progress - one coat paint was definitely not 1 coat!! More like 4 but we got there in the end! We painted over the exisiting wallpaper. It was a smooth paper in great condition so after a quick wipe over with the TSP solution we painted with an Eggshell finish paint in a greige colour (Behr's 'Creme de la Creme'). It went on sooooooo nicely - we barely needed a second coat and it was a real pleasure job after all the cabinets! 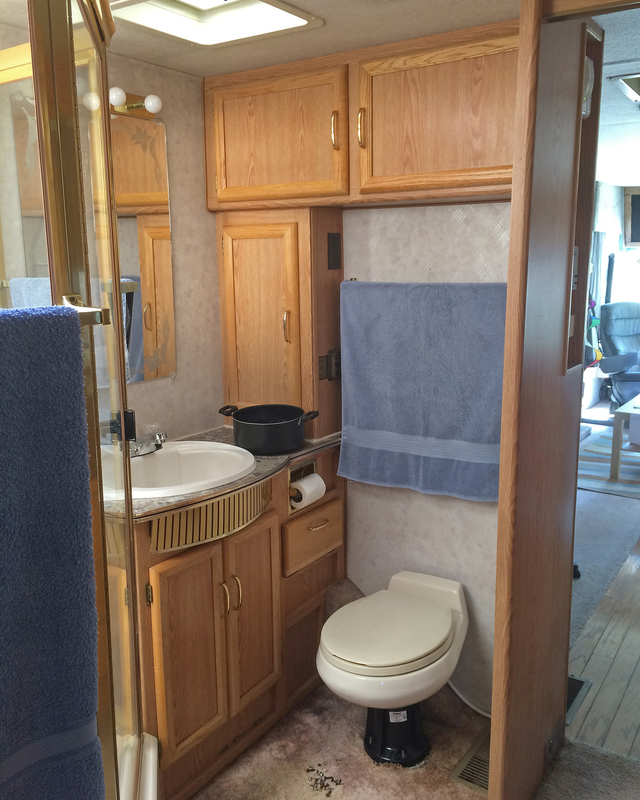 The final update to the bathroom was the addition of some tiling around the sink area. Adding some tiling really jazzed things up and changed the look dramatically! I used the peel and stick Stick-it Tiles'. I'm delighted with the look but not totally convinced on the application. I think they may have 'slipped' slightly since I put them on and the top edges are peeling back a little. They do suggest using glue which seems to defeat the idea of self adhesive tiles but I will try next. All that's left is the flooring - which will hopefully happen sometime this fall (once we've installed a new roof and hopefully stopped any water leakage issues!!). 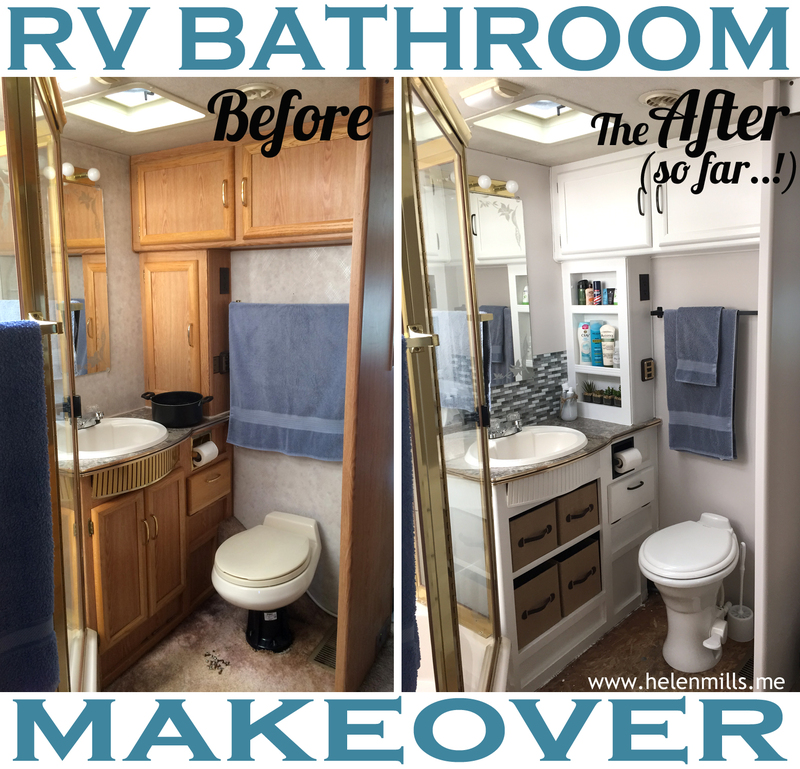 Harvey gets a makeover...Our RV Renovation project! So back in the day we used to travel around North America in Harvey. It was the travelling around for nearly 5 years that led us to Canada. When we eventually settled and bought our home in the Okanagan Harvey the RV took some much needed down time and sat out to pasture for a few years in a friend's field. Amazingly nearly 6 years have passed since that happened! And our poor old friend is showing the signs of neglect and his age (Harvey is a 1996 National Dolphin 36ft Motorhome). Because this is our view from the door! Except things never really go quite as planned do they?!! 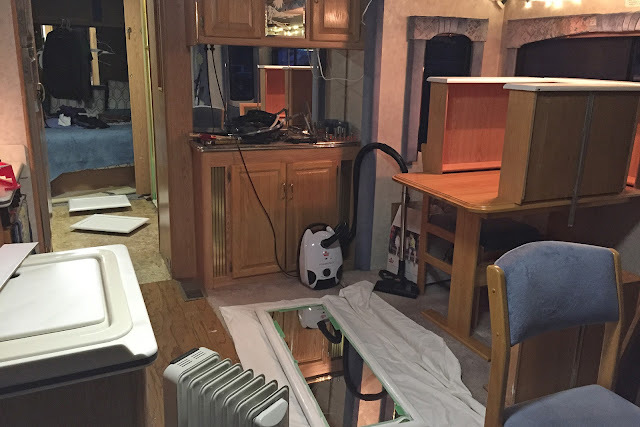 Once on site we discovered that he hadn't been winterized properly and just about every bit of plumbing was leaking. Then that list of problems just started getting added to...I could give you a giant pity party list of everything that was wrong but honestly I'll just bore myself and start sobbing (again). We'd been told about a leaking toilet prior to getting Harvey back from the friends who'd borrowed him - unfortunately the fix they'd done involved a small glass bowl catching the drips and not a not else! 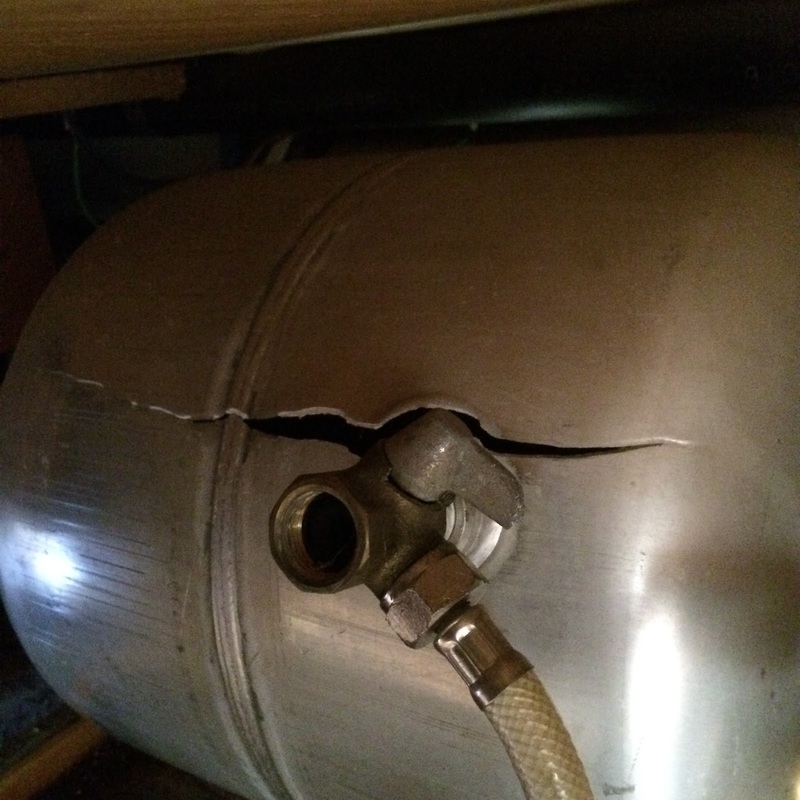 But whilst fixing that issue we discovered a much larger issue - since the toilet hadn't been drained for the winter the water sat in the pipework had frozen and split the pipes. We didn't realize this till we turned on the water and the next day discovered a slow leak had seaped its way all across the bathroom carpet. It was this sodden carpet that was the catalyst in getting stuck in renovation mode. I'm not sure at what point I ended up down the path of complete renovation but I think Pinterest must take much of the responsibility! Honestly I got carried away with pretty pictures, beautiful decor and clever hacks and tips to DIY reno' your RV or trailer! 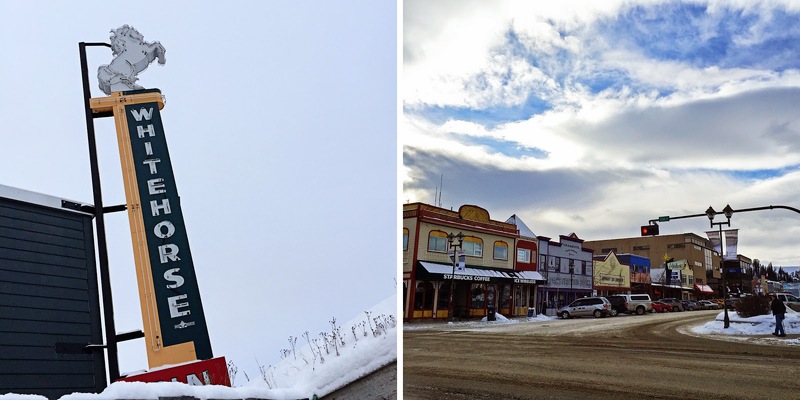 Whitehorse is a pretty small town of around 37,000. It's the main city in the Yukon with over 75% of the population living there! Whilst it started off it's life caught up in the craziness of the Klondike Gold Rush, it's settled into it's current role as a main stop-off on the Alaska Highway. The highway was built in 1942-43 by the US Army after the Pearl Harbour attacks. It was handed over to the Canadians following the war and now it a major tourist route between northern BC and Alaska where thousands travel each year. Obviously not many of them travel the road in winter....and so Whitehorse is quite a sleepy little place in the off-season! But that's not to say we didn't have plenty to fill our time on our 3.5 day break! We used Airbnb to book our accommodation. (and if you use this link to sign up for Airbnb you'll get a $30 credit on your first stay!) 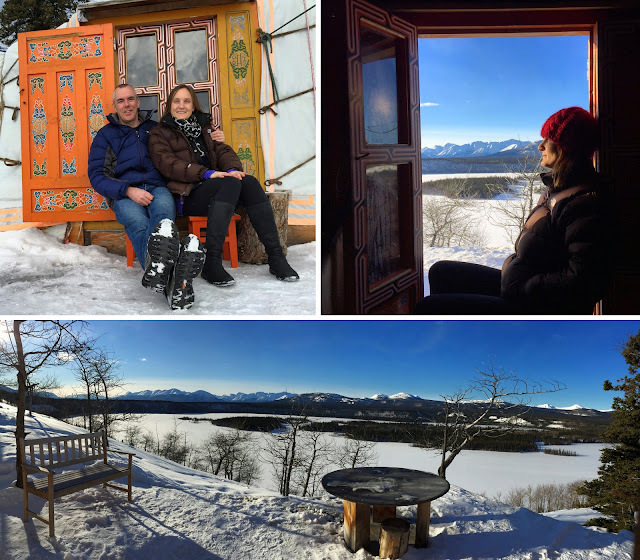 We spent our first 2 nights in the city and the second 2 nights at an incredible Mongolian Yurt about 1/2 hour out of town overlooking a frozen Cowley Lake. The Yurt wasn't just our bed for the night but ended up being a really memorable part of our trip! We arrived after dark and had a brief 1/4km walk through the trees and along a ridge line to get to the yurt on a well trodden snowy path. It was a clear night so we got a hint of what the view would bring us come morning - it was so exciting! Our host had the wood burning stove roaring away and the yurt was amazingly cozy and we immediately felt right at home. Come morning we stepped out onto the little deck perched right on the edge of a high ridge to a stunning view of the snowy mountains in the distance and an expansive view out over a frozen Cowley Lake. Views from our cozy Yurt! Overlooking a frozen Cowley Lake where we snowshoed on our final morning! 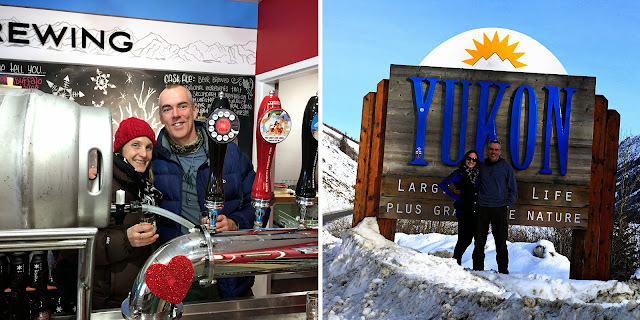 We spent some time exploring Whitehorse itself - the city is quite compact and easy to walk around...we got lucky with the weather and had quite mild temperatures during our stay. We found some awesome little shops to explore - the Aroma Borealis was a lovely shop full of scents, potions and crystals - we brought home one of their unique essential oil blends. The Collective Good was another favourite - it was a beautifully curated design store of unusual and modern home decor, clothing, accessories and gift items with a great selection of local items but full of many others from all around the world - we'd been looking for some coat hooks for our mud room for the longest time and I was happy to find something a little different here! And we couldn't pass up the opportunity to get our 'outdoor store' fix! 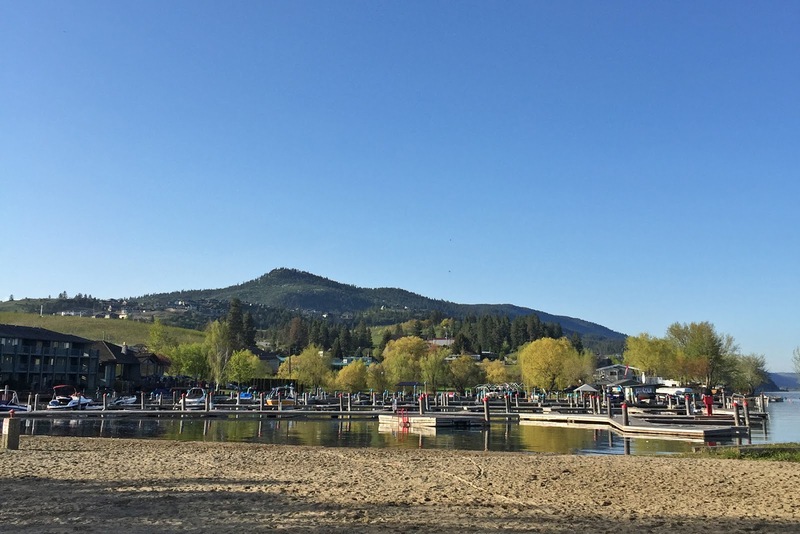 - we both could spend forever in a great outdoor & sports clothing and equipment store - Coast Mountain Sports was Whitehorse's answer to REI and MEC! Obviously it's a great outdoor adventure area and they have a fabulous store to service it! And of course we couldn't pass up the local brew - Yukon Brewing, where you can sample all their beers on tap! It may be small but Whitehorse serves up some top-notch eats! We loved pastries at Baked Cafe, Brunch at Burnt Toast, hot chocolate and snacks at Bean North. We dined at Antoinette's on our first night - a friendly and busy spot serving incredible Jamaican food with some wicked flavour and flare. We took our time over dinner, enjoying the house created cocktails and even managed to save room for dessert - squeezing in as much of the awesome food as possible! 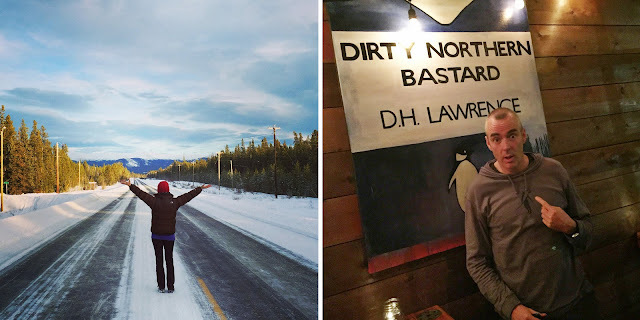 We picnicked in the yurt on our second night and on our final night hit up the Dirty Northern bar. We'd heard great things about their pizza and it didn't disappoint. We lounged in the thermal waters at Takhini Hot Springs, visited the small but awesome MacBride Museum - I loved exploring the exhibits on 'ye old life' and socio-economic growth of the town - lots of stuff on the gold rush and rural outpost type life! We took a 2 hour drive south to pop into Skagway, Alaska (where it was a totally different climate and not a snowflake in sight!). 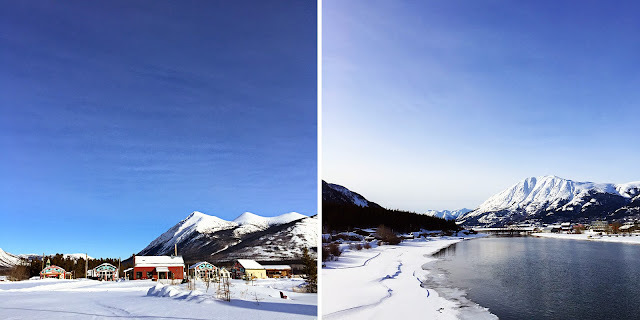 The drive south was stunning and we had gorgeous weather for it - blue skies and the crisp white snowy mountains as far as the eye could see, stopping at Carcross briefly en route! Views around Carcross on our day trip to Alaska! Our final morning before our flight home we squeezed in a snowshoe hike across Cowley Lake - the snow was crazy deep so it was a healthy workout! Just as well as our journey home ended up being rather long and frustrating. Having flown via Vancouver all the way back to Kelowna, we were on finals with the wheels down before deciding the fog was too bad and they routed us back to Vancouver with a night in a hotel! Oh well, bonus day on vacation!! And a great vacation it was too! *And whilst we caught a glimpse of the Northern Lights it was a little faint and shimmery pale blues - not the wild dancing greens you see in photos, and so for now I'm not quite 'satisfied' enough to check it off my bucket list and the aurora battle continues!